A now uncommon and quite pricy climbing book. Climbing and mountaineering are good subjects with a large customer base willing to spend money. It is a hard section to keep stocked in a shop. 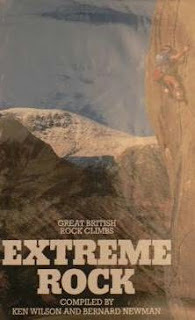 The author's stated aim was to provide a snapshot of the best of what Britain had to offer and to encourage climbers to try different areas. A note on the web by a keen climber who had done every climb in this book states: 'Note that there is currently no access to Chapter 39 - Grea Wall, Craig y Forwyn due to the landowner objecting to the behaviour of some climbers at the crag...' What was going on there? Bernard Newman, the co author appears on one fantasy fiction site with this book and works going back to the 1920s attributed to him. I am certain that this is the other Bernard Newman (1897 -1987) the prolific espionage novelist author of 'German Spy' (1937). The climbing Newman is probably a great deal younger and alive enough to co-write a book. These confusions happen alot. VALUE? Copy at UK Bookworld for £250 described thus: 'True first printing, not a later print run [which has a ISBN mark on the rear dustjacket]. 11" by 9". Pp xi, 296. Many photographic illustrations. A superb near fine copy in a near fine dustjacket ( price clipped). No inscriptions. Heavy book, photo essays..." One appreciates a dealer who describes what he or she has, some merely give author title and price. Name, rank and serial number-- sometimes with a catchall condition description 'may show some wear.' Copies at ABE at £395 and £495, the latter with a specialist. A reprint could lower the price.